The settlement of Ponca City in 1893 was a product of the Cherokee Strip land run in September of that year, which opened the Cherokee Outlet to settlers. By 1899, there were already Jewish families settling in the area. Louis and Carrie Buchheimer, German-Jewish immigrants who moved to Oklahoma from Missouri by 1898, hosted the first Jewish religious service in their home in 1899. In the early years of settlement, Ponca City grew as a frontier and trading town. But with E.W. Marland’s discovery of oil there in 1911, the city’s economy shifted and its population exploded. People moved to Ponca City to fill the jobs at the two oil refineries Marland had built by 1920. The earliest Jewish settlers in Ponca City came before the oil boom. Like Jews in towns all over America, they opened retail stores when they first moved in. Among those who came to Ponca City in the 1910s were Sam and Sadie Lee, who opened Sam Lee’s Men’s Wear on Grand Avenue shortly after their arrival. When Sam died in 1984, his son Nathan assumed ownership. And when the store finally closed in 1998, it had been serving Ponca City for 84 consecutive years. Sam and Sadie helped bring Sam’s two brothers, Abe and Nathan, to Ponca City, and the three Lee brothers owned three different men’s clothing stores on Grand Avenue, within four blocks of each other. In the years between 1915 and 1930, the number of Jewish families who participated in Jewish life in Ponca City and neighboring cities fluctuated between 12 and 20. Families from Ponca City, Tonkawa, Blackwell, Stillwater and Arkansas City, approximately a 45-mile radius, gathered in each other’s homes for services. Nachum Herzmark, whose daughter, Anna Locke, and her family lived in Blackwell, traveled from his farm in Renfrow to lead the community in prayer. Occasionally, the group gathered for services at the Odd Fellows Hall in Blackwell. The Torah they used is now housed at the Hillel of Kansas State University. In 1923, the community began to gather their children at the offices of the chamber of commerce for Sunday school. Leah Buchheimer, the daughter of the first known Ponca City Jews, co-taught religious school with Josephine Buchheimer, her brother Albert’s wife. Despite this religious school, Ponca City Jews did not form a congregation; according to the Ponca City News, local Jews did not hold Rosh Hashanah services in 1923. Although they did not have a formal congregation or synagogue, the Jewish community in Ponca City began to affiliate with national Jewish organizations in 1938. That year brought the establishment of both a B’nai Brith lodge and a chapter of Hadassah to Ponca City. Many of the same families were involved in both of the organizations, including the Lee, Dritch, Locke, and Goldenstern families. During World War II and the post-war era, the Jewish population of Ponca City increased. Henry and Ida Levy came with their children in 1940, as Henry opened a shoe store. During the 1940s, Nita Mae Tannebaum, the Levys’ daughter, recalls the community meeting at Joe and Vera Goldenstern’s farm and in the basement of Bernard and Marie Fractman’s house. Nita Mae remembers teaching Sunday school until she went to college in 1951, at which time there were around seven students in the school. In the years following World War II, Jewish officers stationed at the POW camp in Tonkawa became a part of the Ponca City Jewish community. Twenty soldiers joined a Passover seder hosted by Nita Mae’s mother at their house, and another year the community put together a seder at a church in Tonkawa. The end of the war also brought Holocaust survivors Meyer and Manya Kornblit, whose immigration the Ponca City Jewish community sponsored. The Kornblits opened a drive-in restaurant called the Dixie Dog, distinguishing them from the other Jews in Ponca City, who were mostly either in the retail business or in the oil industry. Dr. J.B. Smith and his wife Bobbie moved to Ponca City, Oklahoma, in 1960. He had a Ph.D. in chemical oceanography and had been hired as a research scientist by Conoco, number 31 on the list of Fortune 500 companies when he joined the oil company. At the time, the Jewish community and Sunday school of Ponca City were meeting in Pythian Hall, and for years the Country Club had opened its doors to the community-wide Passover seder. Despite the Sunday school classes and occasional services, Ponca City Jews were not yet formally organized as a congregation. 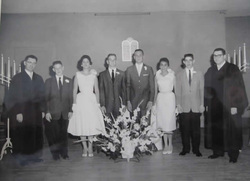 In 1958, they had their first confirmation class, with six students, along with two other religious school classes. Rabbi Joseph Levenson of B'nai Israel in Oklahoma City led the confirmation service. Looking at the changing demographics of Ponca City—Conoco’s research was turning the town’s collar white and bringing in a few hundred scientists—Dr. Smith and a few other members of the Jewish community began to talk about establishing an official congregation and building a synagogue to house it. “We thought…that we’d get together and finally get everybody motivated to finally build the building,” Dr. Smith noted of his collaboration with those who went on to found the synagogue, Temple Emanuel. The community began to discuss plans seriously, and, even without a building to call its own, began to think of itself as a congregation. Multimedia: Manya and Meyer Korenblit lived in Eggenfeld Germany for several years after surviving the Holocaust. Their first son, Sam, was born there. Michael, their younger son, tells the story of his family's immigration to Ponca City, Oklahoma in 1950. This video comes from an oral history interview with Michael Korenblit conducted in Edmond, Oklahoma, July 2012. 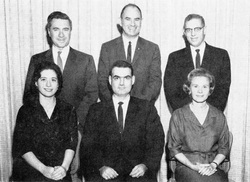 1962 was a monumental year in the development of the Jewish community in Ponca City. Ponca City Jews organized High Holiday services for the first time in many years, bringing in Charles Deutsch from Oklahoma City to serve as acting cantor. Sarah Katz, of nearby Stillwater, lent a Torah for the services, which attracted about 50 worshipers. The Ponca City religious school, which met at the local YMCA, had 25 students in 1962, the most ever. All of this gave Ponca City Jews the momentum to establish themselves as an official congregation. 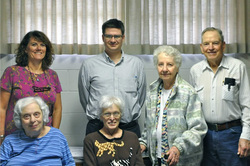 They began to write a congregational bulletin, organized a Building Committee, and formed a Sisterhood. The new congregation, named Temple Emanuel, quickly moved to raise money to build a synagogue. Joe Goldenstern was known for his philanthropy, and it was the reciprocation of his donations to local organizations that helped the synagogue’s building fund get off the ground. In addition to the funds raised from the Jewish community, Goldenstern solicited donations from all the churches in town, to which many Jewish community members had made donations over the years. In a Jewish community whose membership never drifted above 24 families, help from the larger Ponca City community was imperative. Nearly every church in Ponca City made a donation, allowing Ronald Lieber to burn Temple Emanuel’s mortgage at the community Passover seder in 1967. The Sisterhood also played a leading role in the fundraising effort. Under the presidency of Helga Lieber, who fled Germany with her parents before World War II, the Sisterhood organized rummage sales and auctions, and sent their children to pick and sell pecans from the trees on the property that had been purchased for the building. Finally, in May 1964, Temple Emanuel broke ground on their first synagogue. Charles Stolper, who had been the congregation’s first president, served as chairman of the building committee. Arthur Rosenberg was the president of the congregation at the time of the ground-breaking. The community brought Rabbi Joseph Levenson and Cantor Norman Swerling from Temple B’nai Israel in Oklahoma City to officiate at the groundbreaking ceremony. Soon after the building was completed, Temple Emanuel joined the Reform movement, affiliating with the Union of American Hebrew Congregations. By the time of the dedication of Temple Emanuel’s synagogue in November, 1964—chosen purposefully to coincide with the first night of Chanukah, a holiday that celebrates the rededication of the ancient Temple—it had been 65 years since the first Jewish service was held in Ponca City. ​Temple Emanuel has never had a full-time rabbi. According to Dr. Smith, "we suffered along as best we could,” relying on visiting rabbis to lead High Holiday services and life-cycle events, student rabbis from the Reform Hebrew Union College, and lay leaders. Rabbi Levenson from Oklahoma City officiated at the four confirmation ceremonies held between 1958 and 1971, the last of which had only four students. Cantor Irwin Green traveled from Temple B’nai Israel in Oklahoma City to conduct special services for a few years until the early 1980s, while community-member Martin Felsenthal usually led the congregation’s bi-monthly Friday night services. For Temple Emanuel’s 20th anniversary in 1984, Rabbi Lawrence Jakofsky from the Dallas office of the UAHC led services on both Friday night and Saturday morning. Although Temple Emanuel declined from 24 families in 1970 to 16 in 1990, the 1980s was an important decade for the congregation. In 1980, Jeff Martens was born to Mert Martens and her husband Chris, becoming the first Temple Emanuel baby born since the establishment of the congregation. 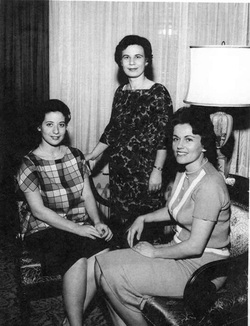 Sophye Locke became the first female president of Temple Emanuel in 1981. In 1986 Dr. Perry Gethner, a professor in the department of foreign languages at Oklahoma State University, phoned Bobbie Smith to find out about services. When he mentioned that he could read Hebrew, Bobbie immediately told him to come. Dr. Gethner soon began leading services at Temple Emanuel. In 2002, Temple Emanuel had only six families and 11 individual members; the Sunday school had three students. Their numbers declined over the beginning of the 21st century. In 2012, Temple Emanuel was able to hold services once a month and during the High Holidays; sometimes they didn’t get a minyan, but occasionally the congregants’ schedules worked out so they could organize services twice a month. Dr. Smith, who originally planned to spend about five years in Ponca City when he moved to town in 1960, has been president of Temple Emanuel since 1992. While their numbers have always been small, the members of Temple Emanuel have worked to educate the larger community about Judaism. Helene Schwartz, who moved to Ponca City in the mid-1990s, often spoke to school and church groups about Judaism. At the community Passover seder in 2012, held at the local Country Club, 12 guests from local churches took part in the dinner in which non-Jews outnumbered Jews. Though the community has shrunk since its heyday when it was able to gather 50 congregants for services, Temple Emanuel still has children. In 2009, Temple Emanuel conducted a bat mitzvah for Cindy Wigley’s daughter, Samantha. Among the congregation’s 14 members in 2012 was a six-year-old girl. The ConocoPhillips merger in 2002 and the company’s subsequent decision to move white collar jobs out of Ponca City have had a big impact on the town. Left with just a refinery, the demographics of Ponca City have changed. These changes have not had much of an impact on the Jewish community since most members are retired. Nevertheless, the disappearance of white collar jobs has made it less likely that Jewish engineers and executives will move to Ponca City in the future. Members of Temple Emanuel are thus beginning to contemplate the eventual end of their congregation. If the oil industry deserves the credit for the flowering of the Ponca City Jewish community, it may also be the source of its demise.